3/8" x 48" x 96" CPVC Sheet | U.S. 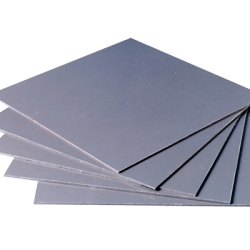 Plastic Corp.
CPVC (Chlorinated Polyvinyl Chloride) boosts the working temperature of other rigid vinyl thermoplastics by 60°F with little change in corrosion resistance characteristics. CPVC safely handles many corrosive liquids. It is virtually immune to solvents or direct attack by inorganic reagents, aliphatic hydrocarbons and alcohols. The forming temp is 310°F - 325°F and the service temp is 33°F - 212°F. It is corrosion resistant, lightweight, high tensile strength, dielectric, non-combustible, and low flow resistance. It is not UV stabilized. Sheets larger then 38" x 48" must ship motor freight.